Got a bit more done yesterday. I mated the trans to the engine for the first time and was glad to see everything should work out. The trans is a T45 5-speed from a 1999 SVT Mustang Cobra, so it originally lived behind a 4-valve 4.6. I wasn't 100% sure that everything would play nice with the 3-valve, but looks good so far. I need to decide on a flywheel, clutch kit, and hydraulic TOB, but the main goal this weekend was purely test fitting engine+trans in the car for the first time, to start converging on a final engine position. There were two bosses on the top of the bellhousing that I cut off due to interference with the tunnel. Otherwise it looks to fit quite nicely, indeed. Shifter location is just about perfect. This T45 is kind of a forgotten trans, which is appropriate I think. From research I found that it is more or less a 5-speed version of the T56 internally. Externally it looks vaguely similar to a T5 but I'm told that it should be much stouter. Not sure how long it will live behind the megatorks from the twin turbo V8 but if needed I could build it up with upgrade parts. Or swap to something else entirely later on. I'm curious to give it a try though. Last edited by Duder; 07-09-2018 at 02:30 PM.. I found this description of the T45. I've seen varying claims about torque capacity. I'm certain this thing will be underrated for the engine, just not sure by how much. With the introduction of the mod motor 4.6L in 1996 came the introduction of the T-45 5-speed manual transmission. All Mustangs equipped with this transmission use an 10.5" clutch. The T45 shares many attributes with the T56, so it is a strong transmission. Its weak link is the 10-spline input shaft which limits power handling. 1996-98 Mustang GT T45 transmissions had an 8-tooth speedometer sensor drive gear and a forward located transmission mount. 1996-1998 Mustang Cobra transmissions had a 7-tooth speedometer sensor drive gear and a rearward located transmission mount. 1999-2001 Mustang GT and Cobra transmissions used an electronic pickup "hall-effect" sensor for the speedometer signal and all had the rearward located transmission mount. 1996-01 T45 transmissions use the exact same shifter as the T5. The 1-2 shift fork is shared between all 96-01 T45s. The 3-4 shift fork was updated in 1998 thru 2001 and is a common upgrade for 1996-97. The reverse fork was also updated in 1998 and there are three different versions available. Speaking of reverse, the T45 was the first Mustang transmission to feature a fully synchronized reverse gear. All T45 varieties use a ribbed aluminum case with integral bell housing. Thanks for the link. 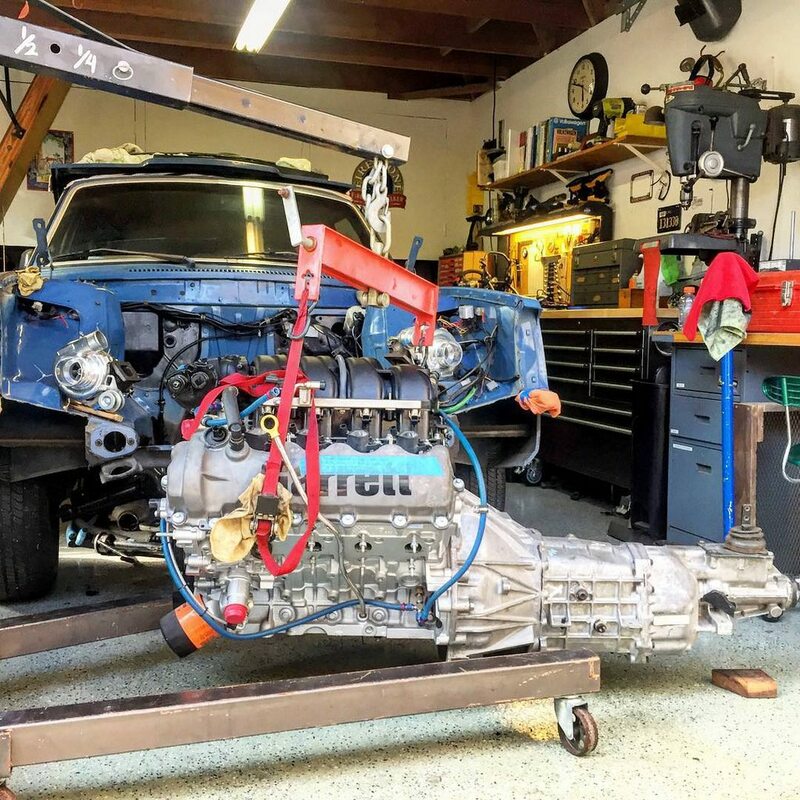 I've seen various numbers quoted between 330 - 400 lb-ft as the torque capacity but I suppose I'd have to talk with a Tremec engineer to get the straight story. From what I've read the 10-spline input shaft is the main weak point, and there's a higher spline count shaft available somewhere. This car will be more of a highway cruiser than anything; it won't be a drag car so I think I can get it to live for an acceptable period of time if I limit hard launches. Or just make sure I'm always on old, hardened rear tires. I dug up one of our old dyno plots from my file archives, which I forgot I had. It actually made less torque than I remembered. 487 lb-ft at ~4500rpm. This run was on a Dynojet so these are rear wheel numbers, but still, I'm feeling a little better about the T45's chances of survival. You can see what a dog the 3-valve 4.6 was originally and how less than 10psi of boost really woke it the F up. 300 lb-ft was the rated capacity for the V8 Stang T5’s; 330 lb-ft for the aftermarket T5z. Suspect the way you want to use it, 3rd gear might be the weak point - it’s the furthest away from a support bearing. I’m 2 years/4000 miles into a 40k mile T5z in perfect condition behind a new crate LS3. No super sticky tires, no hard launches. Working just fine so far. Suspect the biggest unknown, assuming it’s unknown, is what kind of shape the t45 is in. Keep in mind, all these rated capacities were also linked to a manufacturer’s warranty. The trannys may well hold up to higher numbers, but not with a warranty backing them. Love what you are building with this project. My brother and I have a project 67 MGB GT with a 289 swap in it. They used spacers on the crossmember to get that bit of extra clearance for things. Give yourself more room with spacers. Yeah I'll take 400-500 lb-ft from 3200 to 6200...should be sufficient for merging onto the 405. That is in the plan now for sure. It will give me more clearance for manifolds & downpipes, hopefully will allow the hood to close, makes a bit more room in the tunnel and might even make the oil pan mods less severe, if I end up gaining any clearance between engine & crossmember. Right now I'm weighing pros & cons of mounting the engine to the crossmember or directly to the top side of the frame rails, incorporating the upper crossmember bolts. yeah so flat engine masters banned the mod motor from competing. LS what? Heh. Apparently they were banned for a few years then allowed back in, albeit in their own class. Seems that now there are only 2 classes: traditional muscle, and vintage. Some of the stuff people do for that competition is pretty weird but inventive and impressive. I've been doing lots of mockup, measuring, and good old staring at the engine bay & turbo system over the past few days. A few plans have been revised and others have been firmed up. I'm considering keeping my engine mounts as high as possible, tucked just under the exhaust manifold on either side. The log manifolds themselves will need a slight upward tilt to make that work. But it will give me room for exhaust downpipes underneath, as well as for the steering column and rack on the driver's side. I think building the mounts off of the top surface of the frame rails is a good idea, bolting in using the 4 subfame bolts, and then maybe a short stabilizer piece down to the crossmember. Progress was made on the charge plumbing and intercooler fronts, but I'll take some photos and post that in a bit. Also ordered a simple splined steering shaft from Coleman Racing to replace the big diameter damping dongus that would foul on the manifolds. Still need to install that, and evaluate moving the column pierce point in the firewall, to the left as viewed from inside the car. In the meantime here are some early CAD screenshots of the engine packaging model within the 240 bay model that I mentioned earlier. Pretty clear that the oil pan will need to be notched, which will be next on my list after firming up the engine location and mounts. Nice model. I forgot you scanned the engine bay. That must be so nice. I'm jealous. 21st century TB in here, You're the Man Chris, this is rad. If you need sheet aluminum work let me know and I can try to help out. It is nice for sure. I had help though; can't take credit for the final model. I realized we forgot the steering rack pretty much altogether, and it is another thing that will foul on the front of the oil pan. So I need to get that in there too. Word! What kind of sheet aluminum work do you do? I manage a sign shop, But we have 10' shear, break, 12' CNC router table, and access to any number of thickness and size aluminum stuffs. Most of our signs are aluminum any more. Very cool, thanks for letting me know. I'll likely need to make some intercooler end tanks for this thing, and maybe some radiator ducting / blanking plates. I'm sure having them bent on a brake and/or CNC routed would be quite nice, actually! What size pipe is intended to connect to the downpipe? 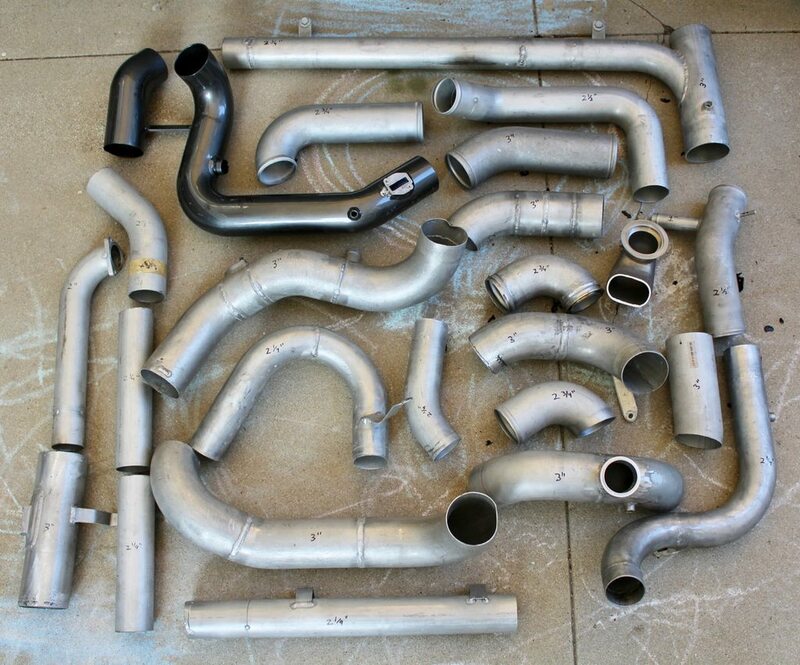 I'm starting out looking at the feasibility of turbocharging my ls swapped 242 while keeping some bare semblance of stock exhaust routing. Without moving the motor, I currently have room for a 1.75 pipe down each side. I'd like to run 3" but doubt that is going to fit, so I'd be happy with 2.5" on each side which should be fine really. I'm thinking of each bank of this engine as a 2.3L redblock with one extra intake valve per cylinder, and VVT. Each of these twin redblocks will be making about 275hp at <10psi of boost, so turbine flow and pressure ratios will be relatively low, meaning 2.5" shouldn't be too restrictive. We shall see - thanks for the input. Final exhaust sizing will have to wait until motor mounts are finished and I have an AC compressor in place. Speaking of tubing, I realized that I've scrounged a pretty good selection for the project. Mostly aluminum, which is great but I have a plan to minimize charge plumbing on this car. A lot of these pieces were from the original 2005 Mustang GT turbo kit test mule, and were being thrown out. Now they are measured, marked, and organized, ready to be put into use. 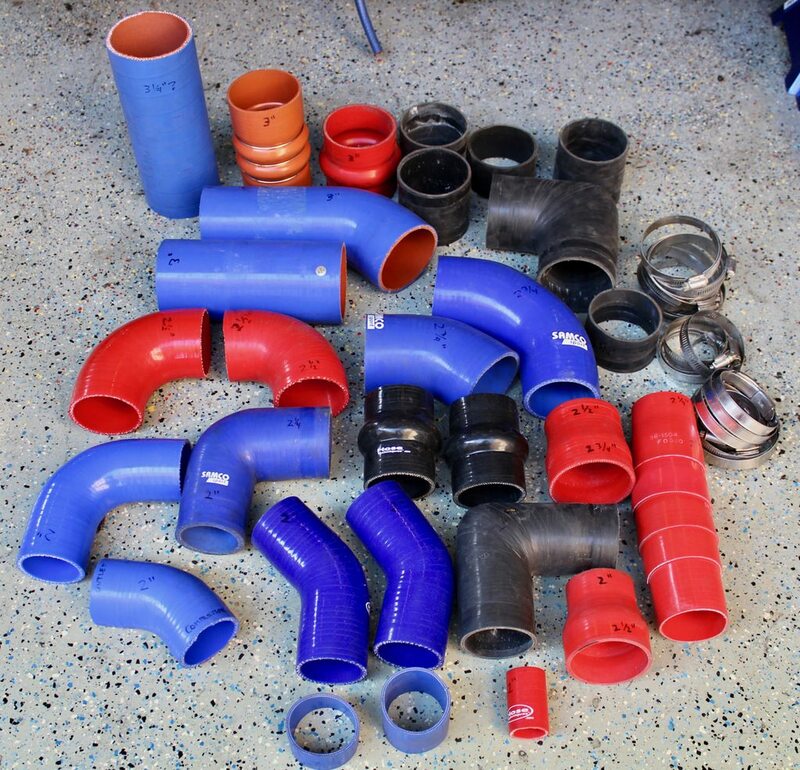 Big selection of silicone hose connectors & reducers will come in handy. Even though they're mismatched some of them are NIB NOS NLA. Steel tube won't be as helpful but you can see the full left hand side downpipe from the display engine with two earlier development versions of the lower section, next to it. I do like the Norma spherical joint & clamp we used on this pipe because it lets you set alignment exactly but then locks the two pieces together solid. I'm likely going to use some 5-bolt to v-band adapters right at the turbine outlet, followed by simple exhaust plumbing (in the 2.5 - 3.0 inch range). 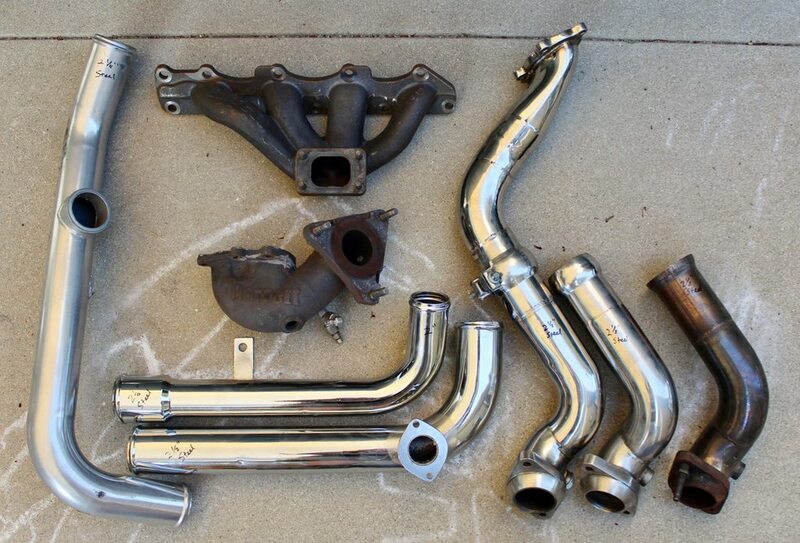 The cast manifold and downpipe here were test parts from a 2.2L Ecotec turbo kit for the Chevy Cobalt. Great engine in a mediocre car. Maybe those will find a future use somewhere. 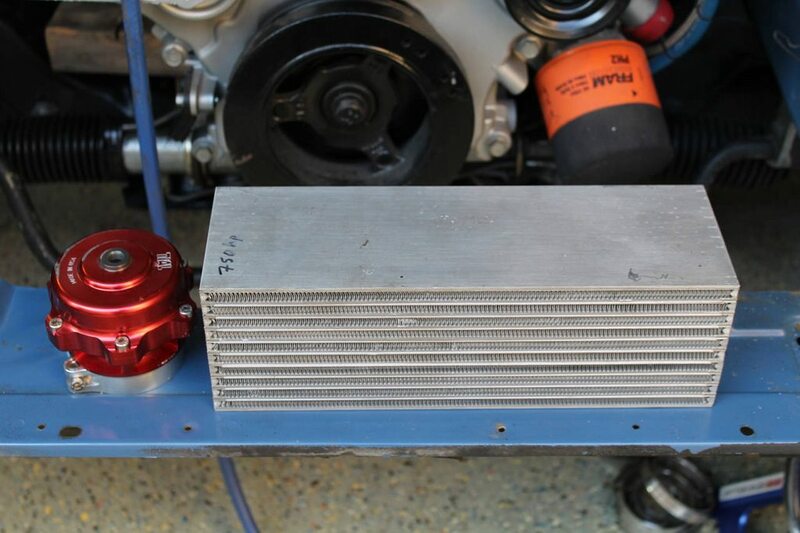 This 750hp air-to-water intercooler core has been hanging out in my garage for quite some time, along with the scratch n' dent TiAl BOV. 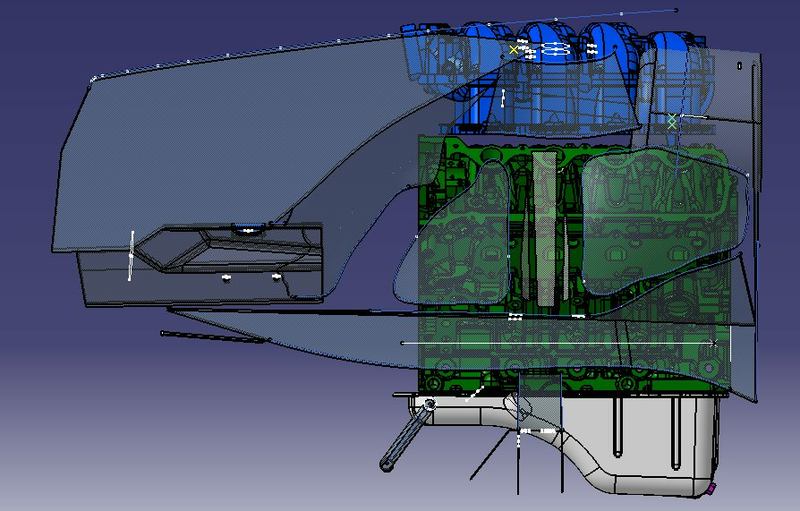 Current plan is to use the A/W core, positioned front and center between the engine & radiator fans. Charge plumbing will come right off of each compressor, to split hot-side tanks on the bottom of the intercooler core. Top side of the core will get a single large end tank and a short run of tubing with a slight bend up to the throttle bodies. Super short and simple. I'll have to brace the cooler to the front of the engine, but it simplifies my heat exchanger packaging. With no A/A cooler in front of the radiator, I can push the rad forward and have more room for the AC condenser, possible oil cooler, and will put the low-temp heat exchanger underneath for the A/W intercooler. I've been researching BMW E39 rear suspension more & more, and found that the Touring (wagon) setup is different from the sedan, in a way that could be advantageous to swapping into a 245. The sedan has tall dampers that live in shock towers in the trunk / hat shelf area. The wagon however has the dampers laid down at more than 45 degrees, from the lower arm and attached to the subframe on a specific bracket. The only springs are airbags and there's a pair of accumulator tanks and a nice compressor assembly that lives in a little hat under the spare tire. All very nicely packaged and enticing for Volvo use. The local junkyard (LKQ Pick Your Part in Wilmington) now has an auto email alert system, so I set it up to tell me whenever they get any new E39 into the yards. I check the photos to see if it's a wagon, which of course it usually isn't. 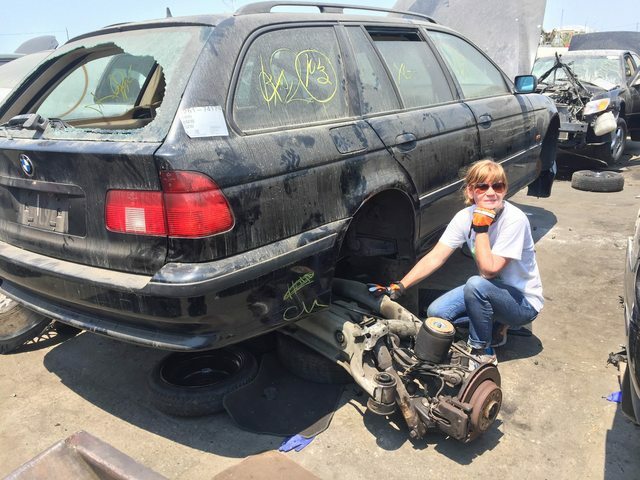 Last week there was a nice '99 528i touring that popped up however, so Michele and I headed over there on Saturday morning to harvest the subframe. I found the car, checked with the cashier to get a price, which was $232 for the "Rear axle assy, independent D to D" plus rotors, calipers, and the rear sway bar. So we spend about 2 hours pulling the thing out (photo above)...cart it over on a wheelbarrow, get up to the same exact cashier, and he pulls out the "oh, you got a bunch of extra parts on there mang" line. Ok, so I figure they are going to tack on $50 or $100 for the airbags, and whatever else they feel like charging me for. I'm not new to this and expect a bit of that. But this guy was out of control, and racked up an $800 price tag for the whole assembly, not counting the air compressor. Would've been $900 with tax! The guys told me "that's not what you asked for a while ago" (it was...) and "that's not a rear independent axle assembly." Yes it Effing is! What the hell is a "rear axle assy, independent D to D" if it's not this?!? I told them to shove it and I left the yard empty handed. Super frustrating but I felt like it was extortion to pay them $900 for this. It was all 528i stuff, so small brakes, small diff compared to 540i, and I likely would've replaced the axles, bags, bearings, seals, etc... I was down for $200 - $300 for an experiment, but they went over the line. If I do pursue the E39 rear suspension / axle idea further I'll probably get a running driving beater and part it out. Or just buy this same exact thing from a bimmerforums member parting one out. Arggh. Ugh, sorry to hear that. That's so upsetting. FYI, some e39 tourings were equipped with traditional springs in the rear rather than airbags (I had one like that). You picked the right lady there if she helps you out.